Europe Boiler Market size for 2016 was valued over USD 10 billion and is set to exceed an annual installation of 6 million units by 2024. 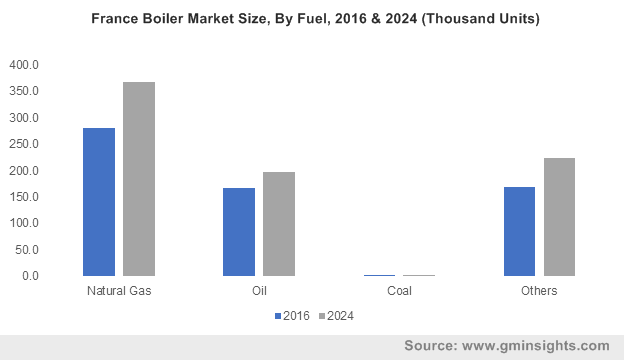 Europe boiler market share is anticipated to witness a robust growth on account of stringent government norms to reduce GHG emissions across residential & commercial establishments. The European Union (EU) in conjunction with respective national governments has introduced rigorous energy efficiency norms which has led to the widespread replacement of traditional heating units. For instance, the Ecodesign Directive, introduced by the EU aims at minimizing the ecological effects of energy related products while promoting the adoption of energy efficient heating technologies. Growing demand for effective space heating coupled with extreme climatic scenario across the region will boost the Europe boiler market growth. In recent years, space heating technologies have witnessed a widespread adoption owing to resurgent economic growth. Shift toward single family housing along with steady growth across commercial sector will further fuel the product demand. As per the World Bank, in 2016, services value added across European Union grew by 5% from 2013 level accounting for over USD 12 trillion. High efficiency, low heating costs and minimal impact on environment are some of the paramount features which will drive the condensing boiler market. These systems offer considerably higher efficiency when compared to conventional heating units which makes adoption of these systems preferable. Growing consumer awareness along with stringent efficiency norms will further complement the industry landscape. Europe non-condensing boiler market is anticipated to witness gains over 2% by 2024. Competitive pricing and ability to withstand temperature fluctuations are some of the underlying factors which will foster the product demand. Ease of installation along with minimal maintenance costs of these systems will further provide an impetus to the business growth. Water-tube boiler market size is set to witness robust growth on account of longer shelf life and safe operations of these products. High pressure handling capacity and competitive pricing of these systems are some the prominent features which has led to widespread adoption across commercial & residential establishments. Rising demand for underfloor heating systems will further enhance the product penetration over coming years. Europe fire-tube boiler market is anticipated to witness growth over 2% by 2024. Ease of installation along with minimal maintenance cost offered by these systems makes its adoption preferable over conventional heating systems. Compact design coupled with growing predominance of single family households will further boost the product demand. Gas fired boiler market is set to exceed 3.5 million annual installations by 2024. 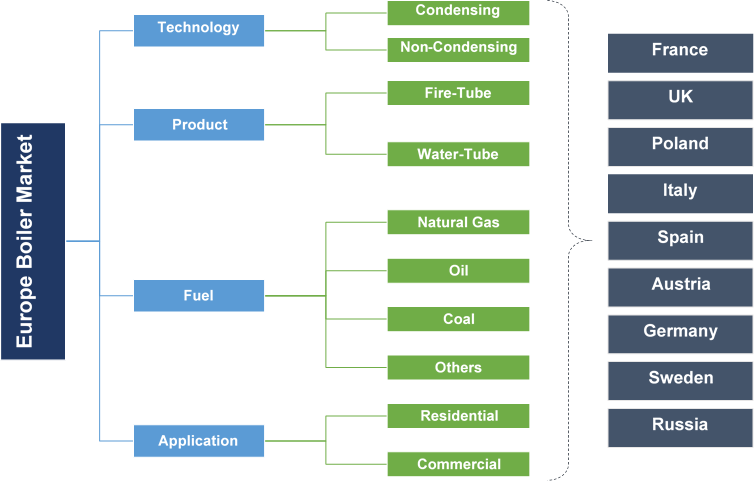 Shifting trends toward adoption of energy efficient heating systems coupled with competitive natural gas pricing will stimulate the demand for these products. Robust gas supply networks, single market across the EU and high operational safety are some of the key factors which has led to escalating demand for these systems. Oil fired boiler market will witness growth owing to the cost effectiveness of these systems. Price stabilization along with ease of availability of oil has resulted in growing demand for these heating systems. Ongoing shift toward adoption of fuel efficient space heating systems coupled with government initiatives to limit greenhouse gas emission will further enhance the business landscape. Residential applications are predicted to witness strong growth on account of introduction of codes and standards toward construction of new establishments. Government initiatives toward zero emission buildings will further complement the business outlook. As per the European Commission, in 2014, newly constructed residential dwellings in the EU exceeded 1.2 million witnessing growth over 4% from the previous year. Europe commercial boiler market is set to grow on account of rising operating costs associated with conventional heating units. Advent of district heating systems along with investment toward the refurbishment of commercial establishments will further enhance the business landscape. Boilers are widely deployed across commercial buildings including offices, institutions and hospitals for the water and space heating. Prominent boiler market participants include BDR Thermea, Bosch, Daikin, Lennox, Viessmann, Bradford White, Wolf, Weil-McLain, Siemens AG, Burnham, A. O. Smith, Groupe Atlantic, Ariston Thermo Group, KyungDong Navien, NIBE, Vaillant Group among others. Product innovation, acquisitions & collaborations, streamlining supply chain networks and regulatory conformance are some of the key strategic initiatives undertaken by the manufacturers to secure a competitive position. A boiler has closed vessels that are used to provide hot water and steam for variety of applications. These systems transfer heat to water, which is then circulated through various devices including radiators for heating purposes. Growing demand for space heating along with introduction of energy efficiency standards will foster the industry growth.